Hello my beauties, hope you are all doing well. I was actually hoping to post something completely different today, but was having trouble getting my words right (writers block). So instead, I thought I'd share with you some of the things on my wish list and will be adding a new weekly segment to my blog titled: Girly Inspiration. I'm a really huge fan of Etsy.com and I encourage you to go and check it out. All the items on sale are either handmade or vintage, so you're truly getting something unique. I also think it's important to support small business. 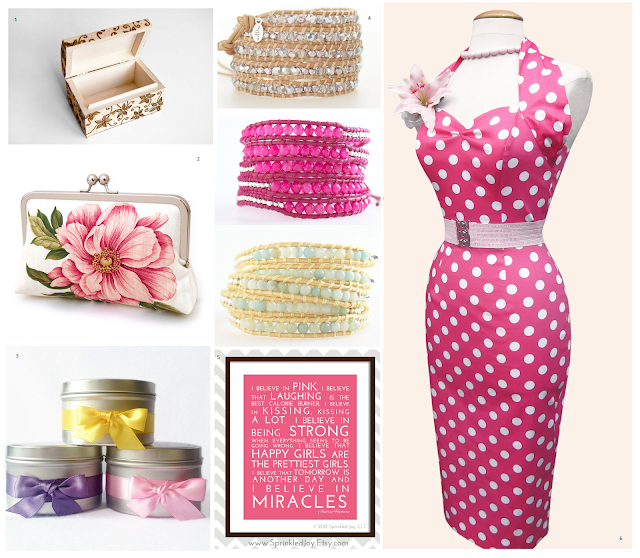 With the exception of the dress, all items here can be purchased on Etsy if you're interested*. 5.Audrey Hepburn quote wall art. No problem, I'm getting that one as soon as the next pay cheque comes in, it's soooo cute. How did you even know I linked it? I'm guessing etsy sellers have some sort of link analytics. Just stopping by to say that I hope all is well with you! Would love to read an update if you get the chance! Thanks for the link to our candle shop! :D This collection is lovely! Like what you read? Tips are appreciated. Hello my darlings, I'm Glitter and Roses. I'm a young, London based black girl determined to live well and help my fellow women/girls live well too. On my site you will find numerous materials on living the best life you can live, being the most elegant woman you can be, unleashing the power of your femininity and hopefully, escaping Blackistan. This blog is open (and can be useful) to women of all ethnicities to read, but as a black women, I tend to focus on my fellow peers.